Racing Hero: Dale Earnhart - he drove with ambition in every race. Crew: Lonnie Green, Mick Green. Sponsors & Support: Sioux City Musketeers, Jim's I-29 Lounge & Casino, Fedders RV & Marine, Gunderson's Amazing Fireworks, Sirius Satellite Radio, and my parents for helping me get into the sport of racing. 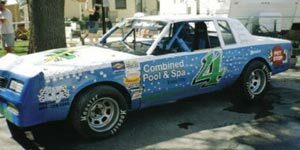 4th place in Points in 2000, Most Improved Driver Award in 2000, Feature win at Park Jefferson Speedway on Cheaters' Night, 5th place in 2002 Points, 9th place in 2004 and 2005 Points at Blackbird Bend Speedway. First A Feature win in 2007 at Wagner Speedway in Wagner, South Dakota. I became involed in the sport of racing with my grandfather. He would travel all over the Midwest to watch races. Plus I was an assistant flagman at Interstate Speedway. 2007 is kind of an off year for me because my schedule at work is nights, so I only get to race a couple of times during the year. To finish every race without tearing the car up. Hopefully a Feature win in the IMCA Stock Cars. I also race at Buena Vista Raceway in Alta, Iowa with the 4 IMCA Stock Car. My main tracks will be Interstate and Park Jefferson. My grandfather died after my first year of racing and I have his ashes in my car for him to be there at every race.